Princess Charlotte Elizabeth Diana of Cambridge was baptised at the Church of St Mary Magdalene on the Sandringham estate in Norfolk this afternoon. It is the first time we have seen the Cambridges together as a family of four publicly - and what a joyous day for it! The family made the quarter-mile walk from Sandringham House to the church. Interestingly the large traditional silver-wheeled Millson pram Charlotte travelled in has a family history of its own - it was once used for the Duke of York and the Earl of Wessex. It was an intimate ceremony attended by close family, including Her Majesty the Queen, the Duke of Edinburgh, the Prince of Wales, the Duchess of Cornwall, the Middleton family and the godparents and their spouses. Prince George was impeccably behaved (and adorable as ever) as he held his father's hand during the walk. Adam Middleton - Kate's cousin, the son of Michael Middleton's brother Richard. Adam works for Mayfair firm Manchester Square Partners. The Hon. Laura Fellowes - Princess Diana's niece, the daughter of Diana's older sister Lady Jane Fellowes and Baron Fellowes, who served as the Queen's private secretary throughout the 1980's. James Meade - Prince William and James Meade have been close friends since they attended Eton together. He is the son of Olympic gold medallist equestrian Richard Meade. He has become of a close friend of Kate's too, and accompanied her to the Badminton Horse Trials after her brief split from William in 2007. Sophie Carter - A friend of Kate's for years. Sophie isn't someone we've seen photographed much over the years, but she has been described as a "discreet and loyal" friend. Interestingly, Ms. Carter and fellow godparent Thomas van Straubenzee used to be an item. Thomas van Straubenzee - Known simply as 'van' to his friends, Prince William and Thomas have been friends since they attended Ludgrove prep school in Berkshire together. He accompanied William on his gap year to New Zealand. Both William and Harry are patrons of a charity in memory of his brother, Henry van Straubenzee, who died in a car crash aged 18 in 2002. Royal commentator Victoria Arbiter noted all godparents share a common bond with William and Kate: "Each has a long, in some cases life-long connection to William or Kate. Trust and loyalty at the core." 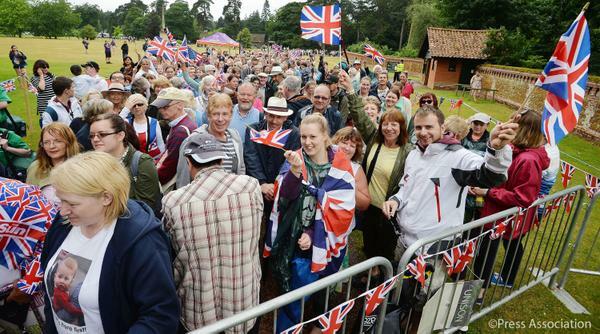 As expected, thousands of well-wishers from the nearby Norfolk area and much further afield travelled to St Mary's to catch a glimpse of the Cambridges. The Palace said the Duke and Duchess were "pleased to welcome well-wishers" and were "delighted" the paddock could be made available. Royal commentators noted it is the first time that the christening of such a senior member of the Royal family has involved the public in any way and it was a much more public affair than Prince George's christening in 2013. The Duke and Duchess's choice of venue was partly due to its proximity to Anmer Hall - the Cambridges' primary family home and the place George and Charlotte will be spend the early years of their childhood - and of course its royal history. The late Diana, Princess of Wales was baptised there and more recently Princess Eugenie received the sacrament there during a public service in 1990. Princess Charlotte is the most senior member of the Royal family to be christened outside a royal residence for 120 years. The Queen’s father, George VI, was christened in the same church in 1895, but for the next three generations Royal palaces were used for the christenings of all senior members of the Royal family. 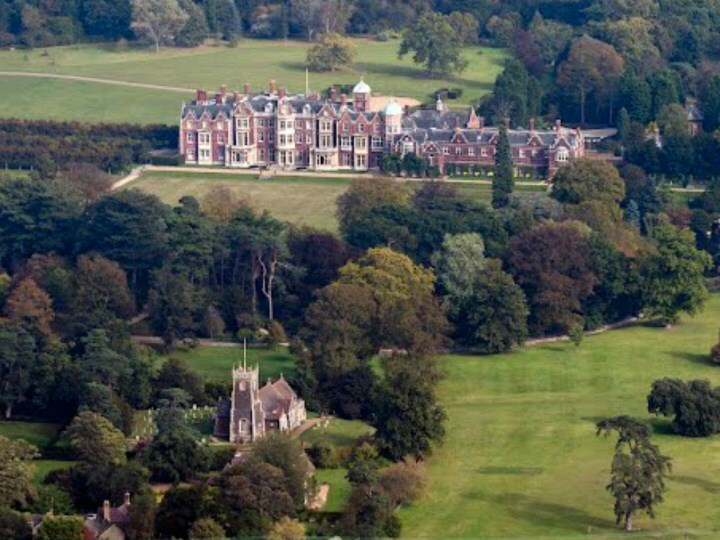 This photo offers an aerial view of the distance from Sandringham House to St Mary's. The service was conducted by the Archbishop of Canterbury, the Most Reverend Justin Welby, who was assisted by the Reverend Canon Jonathan Riviere, Rector of the Sandringham group of parishes. 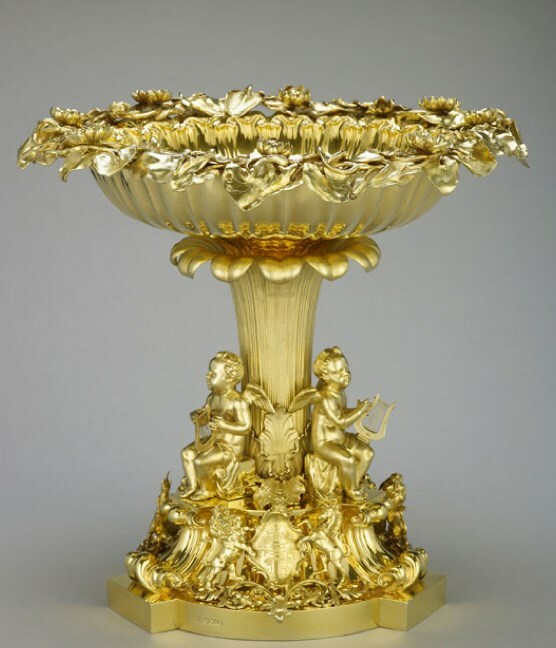 'Princess Charlotte's baptism will take place in the The Lily Font, a small, silver gilt vessel which is part of the Crown Jewels and has been used for almost all royal christenings since 1841. Decorated with lilies, ivy and cherubs, The Lily Font was commissioned by Queen Victoria ahead of the birth of her first child, Victoria Adelaide Mary Louisa, in 1840. It left London as a top secret operation went underway to move the font from the Tower of London to Norfolk. William and Kate chose two hymns for the service: "Praise to the Lord, the Almighty" and "Come Down, O Love Divine". The lesson was from Matthew 18, verses 1-5, read by godparent James Meade. Sandringham Church Choir sang at the service. Two anthems were chosen: "I Will Sing With the Spirit" and "God Be In My Head", both by John Rutter. 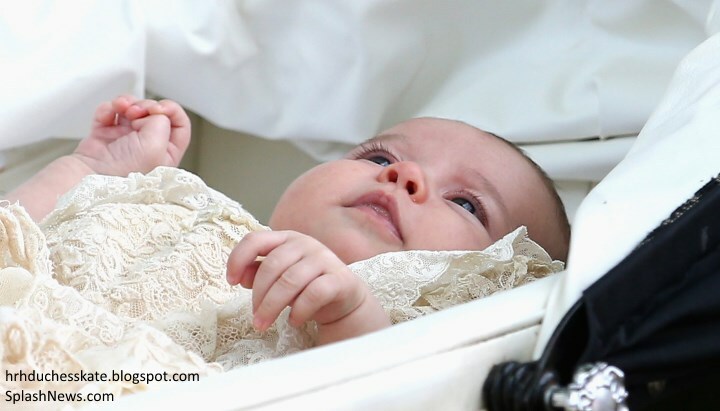 Princess Charlotte wore a hand-made replica of the royal christening robe, made by Angela Kelly, dressmaker to the Queen. The original Honiton lace and satin robe, was last used in 2004 with Lady Louise Windsor being the last royal baby to wear the piece. After years of wear it had become too fragile to use, so in 2008 Her Majesty commissioned a replica. It features the same length skirt, elaborate collars and bow as its predecessor. The first baby to wear it was was James, Viscount Severn, son of the Earl and Countess of Wessex. Prince George wore the robe for his christening in 2013. The guests mingled after the service. A splendid shot of the Duchess with Her Majesty. The Queen talking to Prince George. In the photo below, you'll also see Nanny Maria wearing the traditional Norland uniform. The Duchess of Cornwall and Carole Middleton chatting. The Middleton family were all smiles for the occasion. Pippa Middleton looked elegant in an Emilia Wickstead bespoke high-necked cream coatdress and a Jane Taylor hat. We saw just a few photos of the godparents. Sophie Carter chose a striking coat for the christening. Princess Diana's nice Laura Fellowes. James Meade was all smiles upon arrival. Links to William's mother were very much evident in the planning of this christening. As we noted above, Diana was also christened at the same church. It means both of William and Kate's children have a baptismal link to Diana, as Prince George was christened at the Chapel Royal at St James's Palace where her body lay before her funeral in 1997. According to royal sources, William wanted the date of the christening to be as close to his mother's birthday as possible - Diana would have been 54 last Thursday. Of course, Diana, is one of Charlotte's middle names and Diana's favourite photographer, Mario Testino, will take the official photographs. After the service, the Duke and Duchess will gave a tea at Sandringham House. Guests were served slices of christening cake, which is taken from William and Kate's wedding cake. One imagines a selection of refreshments were enjoyed too, including sandwiches, cakes and scones with jam and cream. Beverages of tea and perhaps champagne will be served. It is thought Prince William may give a brief speech before toasting his daughter. Former royal chef Darren McGrady spoke to People shared the details of a royal afternoon tea. 'It's not a "high tea", as it has been called but an "afternoon tea", he points out. For the Royal family, a high tea is a nursery tea that Prince George might have if he was staying with the Queen. "That might be beans on toast, or little fish fingers," McGrady says. They will likely use the hand-painted Meissen china, of which there are several sets at Sandringham and, in fact, the Saloon is decorated with the china, including vases, and antique tea sets. He adds, "It is low key, and it's mainly family and a few friends. They will not sit at one long table. Some people will stand and drink their tea. Others, especially the ladies, will sit dotted around the room. The Queen doesn't eat much – for her afternoon tea is probably one square of sandwich and one piece of cake. The Duchess selected a bespoke Alexander McQueen cream coat dress for the event. The fit and flare design is a gorgeous piece which worked perfectly with the christening gown. The neckline and fit of the garment is just perfect. Kate wore a pretty cream hat by milliner Jane Taylor. 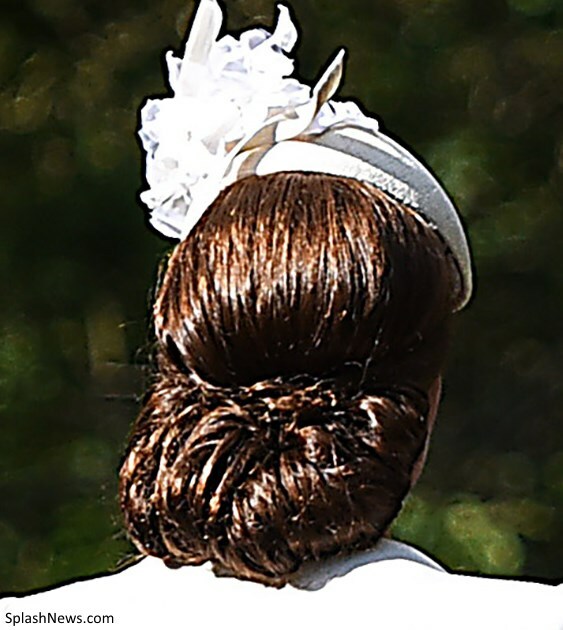 A closer look at Kate's elegant updo. Kate selected a pair of her Russell & Bromley shoes. 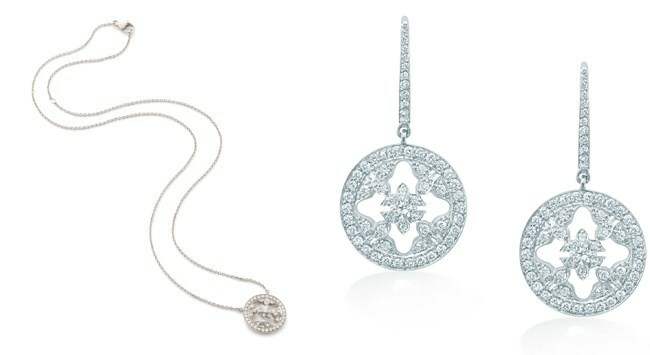 The Duchess accessorised with her Mappin & Webb Empress Pendant and the matching Empress Drop Earrings. It is the first time we've seen Kate wear the earrings publicly. They're available at Mappin & Webb from £3,450 (with thanks to Last Video Corner via Twitter and Anna). 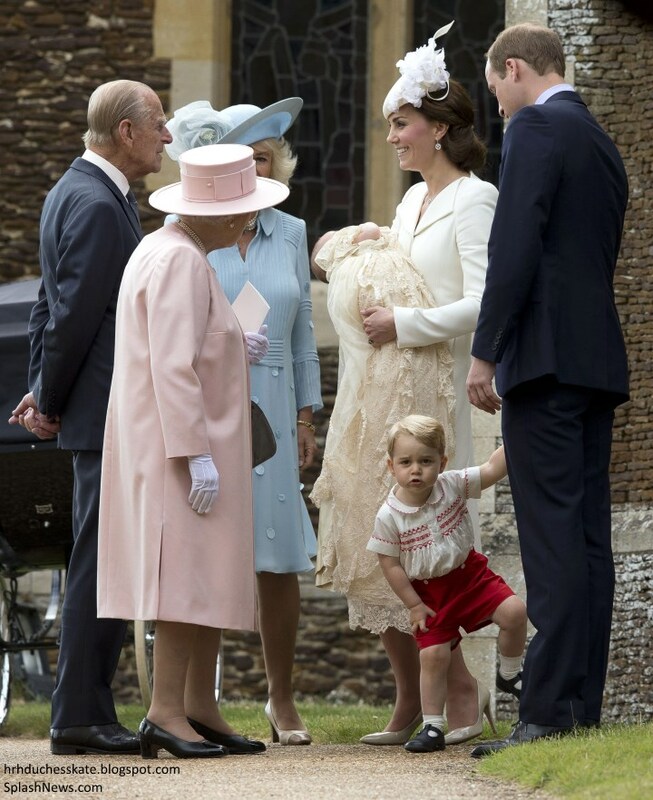 Meanwhile, Prince George looked adorable in the Smocked Set by Rachel Riley (with thanks to Prince George Pieces). It is described as a "traditional 2-piece smocked shirt and short set. The shirt is hand smocked across the chest with a vintage inspired design. 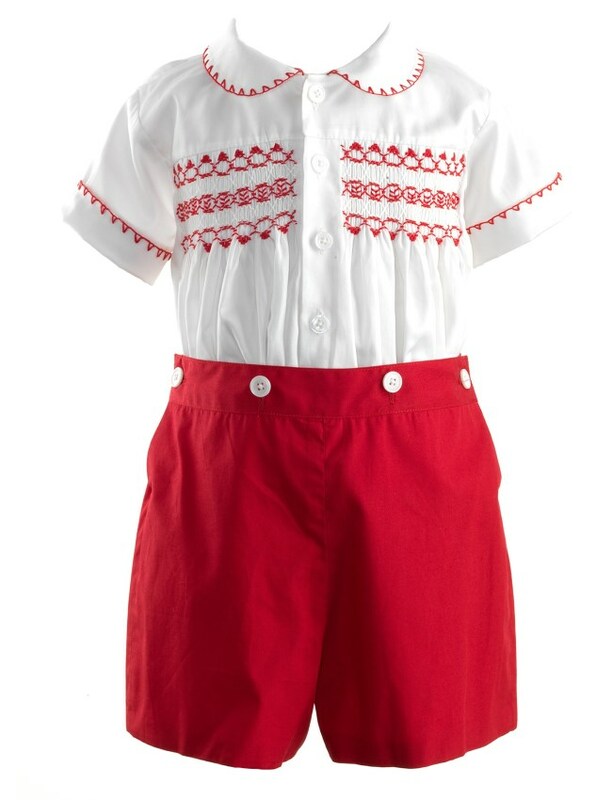 Matching red shorts with button opening at the side - button onto the shirt for a formal look". It is incredibly similar to the outfit Prince William wore to meet his little brother Harry for the first time in 1984. There's a video available on You Tube showing arrivals. It was a beautiful christening and all involved appeared to be having a wonderful day. It was wonderful to see the Cambridges walk to the church and the photos were beautiful. We expect to see the official christening portraits by Mario Testino released in a couple of days. What a lovely, fast post Charlotte. Kudos!! Lovely, lovely. Except the live streams...I have not seen, and cannot find, any video footage! I think it is confirmed that the necklace is a gift from William, and I suspect the matching earrings are too. She would be careful to wear something special on such a special, historically photographed moment. Except she wore more inexpensive pearl earrings for George's, correct? I am glad to finally figure out that Adam Middleton is Adam Middleton! His face has haunted (not in a bad way) photos for a few years, popping up at the wedding and Kate's birthday notably. You hear so little of the Middleton side of the family, I never knew if they weren't on good terms or were just very loyal and discreet...this proves the latter. I agree.. People have complained that Kate seems to have no friends and that they don't hang out with her family. Appearantly they are just discrete which is very, very good for William and Kate to have around them! No wonder they were choosen as godparents. I do think that due to the nature of William being who he is, that Kate's circle of friends became centered around his. Most of the friends she has that are her own are still tied to William in a way. But I think she does have friendships that she maintains, and they are just discreet. They fiercely protect that part of their lives. I think she has friends from way back... but since she was not a public person way back when, we don't know who they are. I also think it's not so much that she has centered her friendships around his.. but that they ran in the same circle.. so have the same friends. Jane I think you are correct. They have been in the same social circles for years. I think Kate has some friends that are hers also though. But for the most part they are a very close social strata. Sorry think the shoes are new but you are probably aware and will change soon otherwise excellent speedy coverage! Correct, the shoes she is wearing are too much of a pointed toe. Great and quick update as usual! Great job ... And what a lovely family!!! Kate and baby Charlotte are gorgeous. I thought Kate looked so elegant and beautiful today. What a wonderful little family of 4, in the English countryside. A memorable event. Great post Charlotte. she does not have platform shoes on today not the ones in your picture just curious.she looked lovely. wish they would have showed charlotte better though!!!! Wow - you are so speedy! Thanks for sharing the wonderful photos and info. Great coverage as usual. I think the earrings are Mappin and Webb and match Kate's Mappin and Webb Empress pendant she's had for a while. I think Charlotte looks just like her brother when he was at her age.. :) My only wish is that I wanted to see her more clearly.. She was most time in ger pram so we didn't see her.. So beautifully orchastrated! 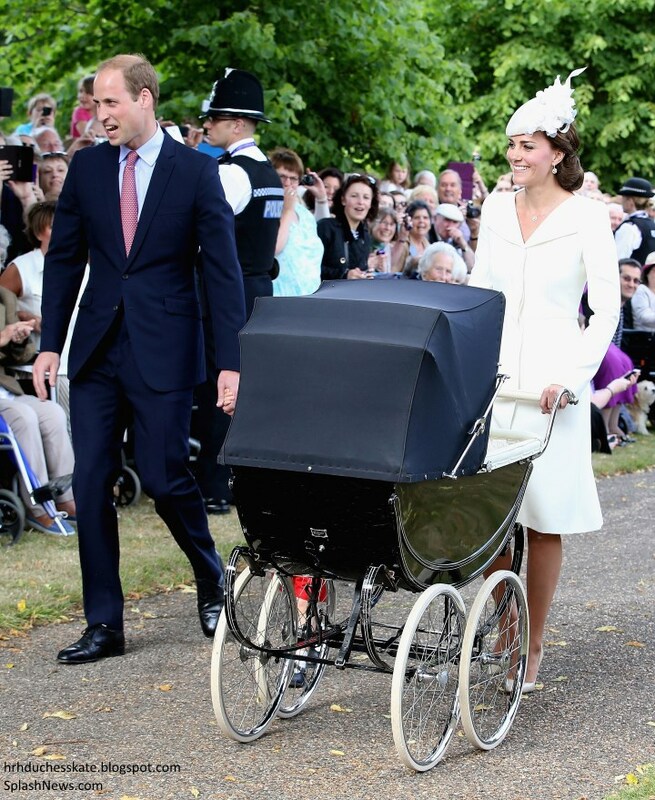 I love that they walked to the church with that vintage pram. Everyone looked so elegant and timeless. Kate looked impeccable. Her coat has a lovely neckline and the center pleat in the back gives it a graceful line. The hat is really beautiful as well. Looking forward to an ID on the jewelry. I'm very interested in what Pippa was wearing, from what I saw it looked very very nice. We didn't get as good of a look at Charlotte as we did of George at his baptism but we will have the Testino photos soon enough. I agree! If someone put an aged grayscale effect on those pictures you could almost mistake them for being from the 50s. In a good way!! Kate looked amazing! She really is finding her stride. Things that people have camplained about (shoes, updo, jewellry) has started to be incorporated. You can really see the difference between Georges baptism and this one. She was really beautiful at both but she is getting more and more comfortable in, for a lack of a better word, lady-style. I never understood why people complained before, it's not like you go and change your style over a day. It's a gradual thing. But it's nice to see the difference. She looks comfortable. Kate does circa 1950s so well, doesn't she Rebecca? I thought Pippa looked gorgeous today... it's an Emilia Wicksted coat dress. I did too Jane and the dress moved beautifully with her. Very elegant choice. Kate's coat moved beautifully, especially from the back. Everything was perfect but the live feed but there were so many wonderful stills that it hardly mattered. Snatching a glimpse when I could they made me so happy. Kate holding Charlotte; Geoerge craning for a look at his baby sister, the queen amd George - who seemed a bit taken aback at great-granny - maybe because of her hat or because the cameraman distracted him. And the wonderful happiness of the crowd - that woman in the pink coat sitting on her the zimmer frame was almost bursting with joy when George gave his little wave! 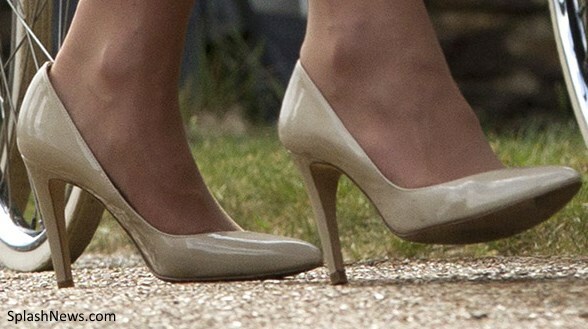 Kate is wearing her 5th Avenue shoes by Russell and Bromley, I uploaded the image of her 'Park Ave' pumps accidentally. I've added a correct shot! What beautiful photos. The shot of PG looking into the pram is just priceless. I love Kate's outfit from top to bottom. Love the hat...with the white flowers very summery and the neckline on the coat dress is elegant and shows off her gorgeous neck...also makes the look more summer appropriate. This is a huge win. I would love to see what Pippa and Carole were wearing. Can anyone tell me where I can see photos of them?? Thanks Charlotte for such a quick post. Outstanding work. The whole event was picture perfect. I think they wear the uniform from the year they graduated... rather than one from a later year. I believe Pippa's heels are from Charlotte Olympia, probably the Monroe style. Hum. Jane that is good for thought. There goes my idea of writing to Norland and suggesting they kindly consider updating their uniforms. The whole family looked great and very happy. Kate looked very beautiful and the pictures of her holding Charlotte are just so very beautiful as well. The bespoke McQueen coat was very nice and look good on her, she stuck with the tradition and wore the same color she did at George's christening. I'm so very glad the choose someone from Kate's side of the family to be a godparent. I said it was going to be a cousin and I was right! Lol. I did not know Kate was as close to her cousin, but he's the same guy behind William and Kate at their wedding and sitting next to William on the balcony at the Cirque de Sole show they want to for Kate's birthday. He's also the one that Kate went to his wedding last year, it's the one I was askning about in a previous post about grandparents picks. So I guessed right and didn't even know his name lol. I agree Rebecca. That becomes almost ethereal in a way. Nothing grandiose meant by that just saying it makes it more photogenically compatible and special. Charlotte, you could not have done a better job!!! What an excellent post, filled with so much information! This will go down as top 5, if not favorite of posts. My favorite part of your post was when every picture had a ton of information and then when it got to Charlotte in the stroller all that needed to be said was "Here she is :) ". First: loved the pictures this time. The outdoor, overcast clouds made every picture pop! 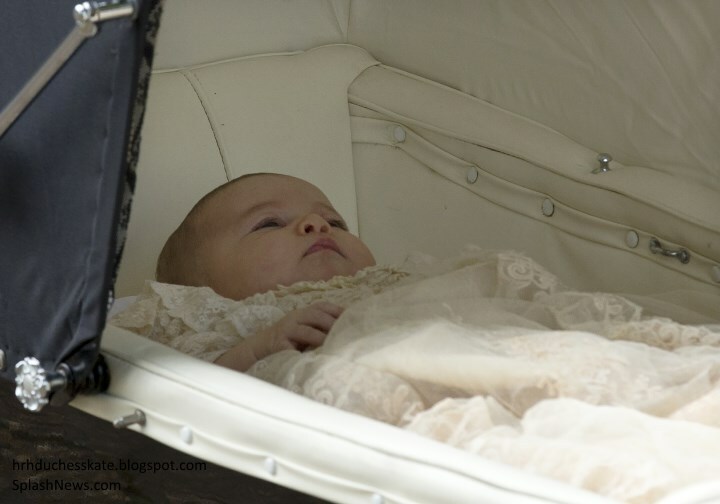 The details on the christening gown were really visible whereas they weren't at George's. Second: Prince George's outfit that very closely matches Prince William's at Prince Harry's baptism (Lots of princes in there! ).......hearts, rainbows, unicorns, fuzzy wuzzies and lovey doveys.......I am not sure if Kate herself planned out all of the symbolism or an aide helped but it was top notch. Third: The family of 4 walking through the gates to the chapel was precious. What a darling little family. Fourth: I want to say at that angle Princess Charlotte looks much like Prince George at that age. Can't say for sure, but definitely there are some similarities! Fifth: Was water from the Jordan flown out for Prince George's baptism too? Sixth: Can't wait to see what family members and the Queen were wearing. Charlotte: beautiful post. Thank you for all the hard work you always do. I went to bed excited to wake up today and your post was better than I hoped for. Now I will go make coffee walking on a cloud. Yes, they have said George's water was from the same river. I have been to Israel several times and it's not unusual for tourists to bring back plastic bottles filled with water from the Jordan River. It keeps forever! I've lost track of the number of babies at our church who have been baptized with this water. It's really not that unusual. John the Baptist baptized Jesus in the Jordan river, VERY special. John the Baptist baptized other people in the Jordan river also. That is why the water was flown over from the Jordan river. Many Christians travel to Israel to be baptized in the Jordan river. I think she might be wearing the version of the earrings with diamonds instead of the plain ones! Otherwise, wonderful post! Doing charity work in Africa. Seriously?! I am shocked they didn't work this into his schedule. Were the godparents hiding? Did they use a back entrance? No pics of em! They arrived by car but walked back with the family. So it's just a matter of time before pictures should show up. They all snuck in...they were dropped off at the entrance and were mostly covered by Range Rovers as they walked up the steps. They walked back to Sandringham, behind the Cambridges. I too am surprised more photos of the family and godparents haven't surfaced. More photos from today... Getty. That one is amazing. She actually looks alot like Kate there! does anyone know what pin Queen Elizabeth wore to the christening? She often ties her pins in to correspond to the event. She did wear pink also. I don't know myself but keep a lookout at the Queens Jewels blog, they always cover her jewellry nicely! Thanks. :) I will go to that blog. Charlotte let me echo the others by stating what an amazing job you did for us today ....not that anyone should be surprised as you have ALWAYS done such great work. My goodness Prince George is just adorable and I do agree that the Princess does resemble him when he was her age. When the photos of the two of them were first released I thought that Charlotte looked like Kate. Now I am not so sure, I guess we will wait for the formal pictures. As I scrolled through the comments today I had to smile at how many of us from the USA are commenting. Speaking for myself, I find so much about the history of the Royal Family, from the actual people to the buildings and the age of things and the traditions so very interesting. Thank goodness for you Charlotte. Happy and safe week all! I thought everything was perfect. Even Pippa's outfit was very nice. Thought the photo of George looking in the pram to make sure his little sister was still around after all the big to do. The children seemed very nicely behaved. Kate looked picture perfect. The pictures of her looking at Charlotte as she held her are priceless. and two mutual friends of William and Kate. In the videos everyone seemed friendly to one another and getting along beautifully. Not only was Diana christened at that little church, I think Queen Elizabeth's father was also. Not quite sure what happened to my comments earlier - wonky computer again, I suppose. 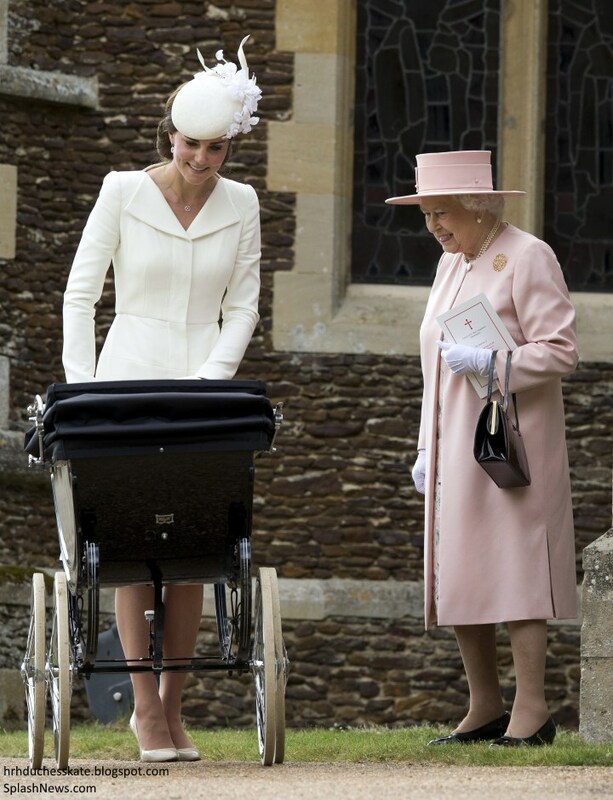 I thought Kate looked wonderful - loved seeing her push the pram. George is such a serious little chap but so adorable. Loved seeing Charlotte. The queen looked lovely in her pink and grey - I love that combination on her. Camilla had a Marilyn moment but she did look nice with a hat not as over the top as usual. The little I saw of the Middletons, they looked very nice. I was thrilled that there was a Spencer and Middleton representive among the godparents and think nothing odd about noit choosing Harry or the Middleton siblings as they are so close already. There might have been pictures taken that are exclusive to the family though :) The godparents might not wanna be that public. Your comment was in the livestream post which isn't there any longer, I think, Julia. Ugh.... the livestreams...... What a complete fiasco! I don't know if it was the media or the PR department that screwed up, but that was really, really bad!! I think Kate needs respectfully request that Sarah Burton needs to redesign the Norland uniform and tastefully bring it into this century. Oleg Cassini designed the McDonalds uniforms. Not comparing Norland to Mcd's. Just saying that that is not without precedent. Kate could open the door for Noland to have that opportunity. It would still be very British and traditional only more tastefully so. I know exactly what you mean, Rebecca. I have love/hate feelings about Nanny's outfit,especially the lace-up shoes. I thought everyone, especially Kate, looked lovely today. Kate's hair was perfection! Thank goodness the weather cooperated. I can't imagine all of those people standing there waiting in the rain. Lovely post, Charlotte. Thank you for your speedy response and in-depth reporting. Anon at 22:44 - I imagine if Kate had an issue with the Norland uniform, she would have just asked Maria to wear a different "uniform." Kate pays Maria - she has every right to ask her to wear a uniform Kate prefers. I think it's safe to assume Kate wanted the Norland uniform there. I thought it was great that she wore her Norland Uniform - a way of showing respect for her position. She would have needed an outfit and hat for the church service and I thought it was perfect. As a retired nurse I can remember when we were very proud to wear our official uniform and cap. I somewhat feel we lost something when they did away with the uniform and cap and went to "scrubs". She worked hard to wear this uniform and she wore it proudly today. It is obvious how much the nanny loves George. Just look at her smile when she is watching George interact with the Queen. Clearly she loves him and is attached to him - as she should be. Regardless of what anyone thinks, I agree that their incorporating family history wherever possible is great. It will never get old. Better than just scrapbooking stuff, although that is nice also. This takes it into living history. As always, a wonderful post!! I love that they look like any other family you would find walking to church (except for the people lining the street and the security of course!) Prince George looks to be a great big brother, I especially love the photo of him peeking into the stroller to see his sister. It's especially heartwarming to see the Queen leaning down to interact with Prince George, he clearly has the hearts of all of his family. All of the photos are beautiful. As for the Duchess, I love this outfit much more than I did the one she wore for Prince George's christening. I'm not sure what it is, but I did not care for her outfit at his. She looks beautiful as always. It was also very nice to see Nanny Maria is clearly a well loved member of the family, as she is right there smiling along with the family and not being kept off to the side and out of sight. The Duke and Duchess are truly are doing a remarkable job of incorporating the many facets of their lives together to raise their children. There are many "normal" moments and activities to complement the royal moments and activities. It looks like it was a beautiful afternoon for a beautiful family. Alaina, I agree and you said that so beautifully. I did like Kate's outfit at George's but liked today's better. I don't even know where to begin. :) What a beautiful, beautiful family! Diana would be so proud she'd be walking on air. Kate looked lovely from head to toe. I loved her outfit and jewelry. George is adorable and William is very much the proud father, interacting with his son in such a natural, effortless manner. Every detail was simply perfect. I think Camilla was really just trying to be nice to all the people who came out of their way to be a blessing to the event. I don't think she was doing that for the camera at all. ^Yeah Anon at 22:24 is right...if Camilla snuck in the back door it would be a snub to the people outside. I know you, royalfan, probably find it hard to believe that anyone may have wanted to see Camilla too, but of the 3500 people there, I think it's safe to say at least a few wanted to see the wife of the next King. I think I hit Publish too soon, and lost my comment. I said that Kate looked very elegant and that Nanny Teresa .in uniform and Kate's policewoman in hat looked quite svelte, too. I very much like Carole Middleton's outfit and the Queen's lovely pink. The Telegragh feed, though discombobulated at times, nicely showed the family's beautiful walk to and from the church. Camilla's brief tussle with the wind, and George's attempted escape provided some entertainment. 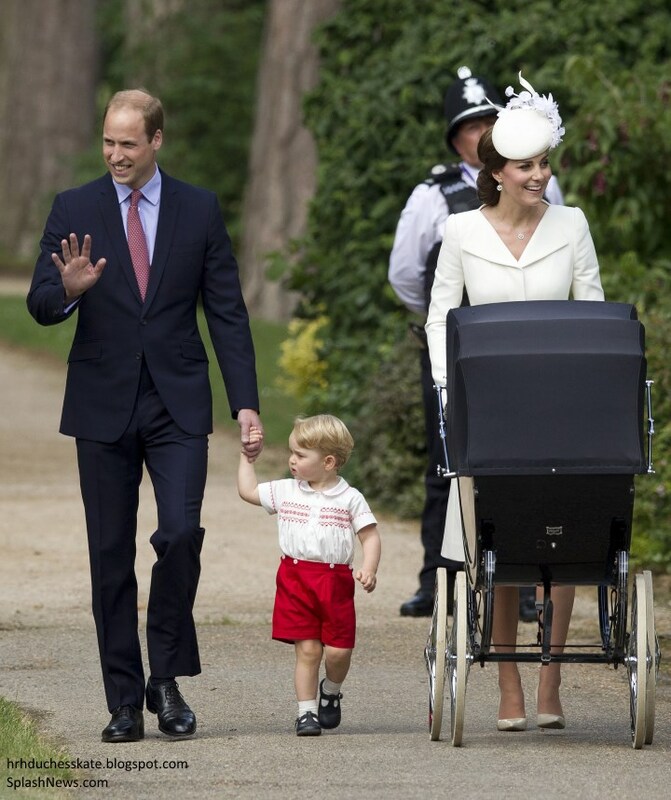 William's care for George is lovely to see, and the choice of godparents is special to friends and both families. I am looking forward to the official photos! I wonder what Prince George wanted when they were leaving that made him start crying a little !? He looked very tired up in Williams arms so I just think it was that he didn't wan't to walk and started tired-crying a bit. Very understandable. Alot of walking and behaving takes a toll on a little toddler! With a two year old it could have been anything. Perhaps he was just starting to tire. That was a big event for a two year old. That is no doubt one of the reasons Maria was there, just in case George needed to exit the festivities because of crying, etc. I think every mom can relate to the variables involved in taking a two year old to an event like that. I think George handled that all very nicely. Now I've had my mandatory "show newest post on the Kate blog"-time with my mother. Thank you soooo much for doing such a stellar and kind work on this blog! You have honestly no idea how much this place actually means in my life!! Isn't it weird that they didn't choose Harry to be one of her godparent? I don't think of their choices as "excluding" Harry (or Pippa and James). I suspect they already play significant roles in the children's lives as uncles/aunt and this is a way of giving other people a significant role. Not at all. Harry will get to have a lot of input into Charlotte's life as the years go by as will Pippa and James. Because then we'd say why isn't Pippa or James ;-) Given the role of a godparent, I think it is assumed this is something you would already expect, and hope, your family would do. I know a lot of people choose family members, but I also see why you would not. I just read where thye do not have siblings as god parents. Everyone looked amazing! Honestly I didn't like Kate's coat when the first pictures started being published but I think it was just the quality of the pictures making me think her outfit was too similar to what she wore at George's christening. Every time I look at the better quality pictures now, the coat is really growing on me a lot. I like the white on her much more than that cream outfit she wore to the last christening. I will say, I thought Camilla's outfit was the best in terms of capturing the "countryside" and summer-y nature of the event. Everyone else wearing coats surprised me a little. Speaking of which, I LOVE Pippa's coat from the back - it's sooo modern yet elegant - but it looks odd to me from the side. The material + the high neck really seemed out of place for a July event. But I'll reserve judgment until I see a picture from the front. The only little things I'll say - and these are tiny things that aren't that important - I wish Kate wore something more visible on her neck. Maybe it's an American thing and I'm just having a hard time adjusting to her neckline/"summery coat" (because that seems like such an oxymoron to me :P) but I just feel like her neck looked a little bare and could have used some pearls or something instead. Just a necklace with more substance. Also George being dressed like baby William was cute for a while but this is like the third time in a month and it's getting a little repetitive. It just seems odd how the Cambridges try to seem normal/modern so often but then dress George like he's in Downton Abbey. He would have looked so dapper in a suit matching William's today! Although he looked very, very adorable today obviously. Lastly, my god I hope Maria Teresa chose to wear her Norland Uniform. I'm a little afraid she was told to just because of how George was dressed and the theme in general seemed to be throwback to earlier times. I saw a picture with her and just couldn't get over it - it just looks so old-fashioned to the point of ridiculous to me, if she indeed did not choose to wear it. She didn't wear the uniform while in Australia doing official events so it's clearly not required for all official events. Anyways - wonderful event! George is adorable! Charlotte, from what I can tell, looks beautiful! And a lot like her brother at that age! she does seem to look almost exactly like George at that age. Ugh! Maggie! One of my pet peeves! Babies and toddlers in suits! He's so young. He has the rest of his life for that. I thought the RR romper complimented the vintage feel of the event nicely. Unfortunately, clothing options for boys are much more limited than for girls. I thought the same thing: Nanny Teresa's uniform is not attractive at all. It reminded me of a brown Sees Candy salesperson. I hope the administration at Norlands views the coverage of the christening and that they realize how much that uniform stood out and in the wrong way. Hopefully, they will have an "aha" moment and redo those uniforms. I'm a big fan of smocking so I liked George's outfit, although I understand where you're coming from. It's not like we don't know who William's mother was. Someone watching the BBC coverage thought a commentator said the the Diana references are "aided and abetted by the Middletons". Did anyone hear that? Makes it sound a bit nefarious. LOL, Maggie. We can always count on kvetching from you no matter what. Unlike in the US, young boys in Europe, Australia, New Zealand often wear shorts until nearly to their teens years. They are boys - not "little men" and I love that. They've the rest of their lives to wear trousers and suits. Catherine - outstanding in every detail! She looks so beautiful. Pippa and Carole Middleton look amazing also. Thanks Charlotte for your hard work on this post. For everyone else - the suit was just a suggestion/personal preference (I think little boys are so cute in mini suits!! But also totally get why it's not everyone's cup of tea). I would have been fine with something kinda vintage-y, or at least more little boy-y; my beef with what George wore was about 90% annoyance at the copying of baby William yet again. At some point it just would be nice to see George in his own clothes. I would have been fine with the copying if it weren't for the fact that this is the third time in a month. The other 10% was definitely preferring an outfit more modern for him just because they've dressed him so old-fashioned for most pictures and appearances. But I get that they were trying to keep the theme vintage and wouldn't have minded something old-fashioned, just dear gawd no more William clothes. Everyone looked wonderful. Kate should go with that up-do more often, it's her most regal look. The hat is my new favorite. Her dress is lovely too. Liked the cream suit for Grorge's christening better but the dress works beautifully for mid-summer. George is quite the charmer. So nice they have honored Diana and Kate's side of the family too. I much prefer Kate's outfit here than at George's christenting. At George's, the outfit seemed to have washed her out with the christening robe. I'm not a fan of Pippa's outfit. It seems heavy and it looks like the dress is wearing her; it engulf's her. Carole's dress is much nicer than the one she wore at George's. Everyone else looks great! Is it just me or is there a lot of Diana references going on: The name, the place where she was christen, the date being near to her birthday, the Spencer godparent, etc. I think its sweet that Will wants to honor his mother, but I feel like there is such a thing as too much. You don't want to overdue it, the princess is going to be compared to her late grandmother for the rest of her life, no matter what. Does that make sense to anybody? No hate please, just making an observation. I think that the references to Diana are not overdone at all. 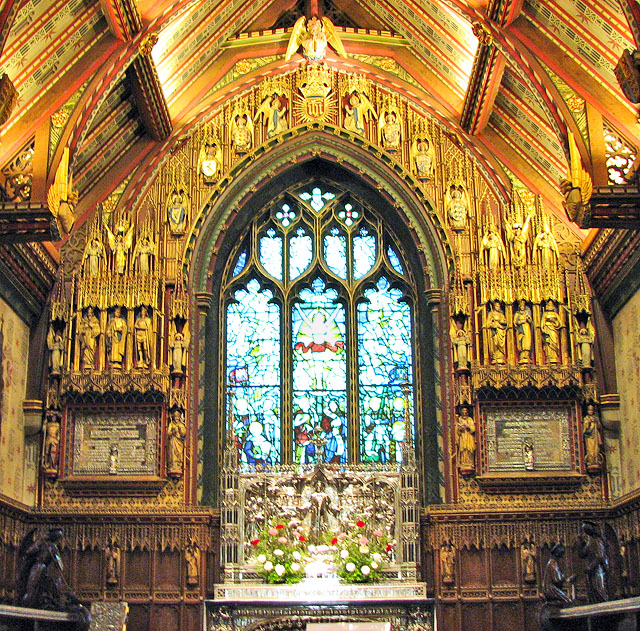 Queen Elizabeth's father was christened there as was Eugenie. Being close to Diana's birthday was a coincidence I think. If William had wanted it done on her birthday it would have been. I doubt Princess Charlotte will be compared to Diana anymore that Kate. A lot of people thought Kate would be but not so. Well, how much is "too much" if you lose your mother at a young age, and she isn't there to share in special moments in your and your children's lives? AND there is the additional factor of being part of a royal family? And I disagree that it was a coincidence. I'm not suggesting that they would have waiting until December, for example, if Diana had been born in that month, but there is something touching about having it on a Sunday in the same week as her birthday. Upon reflection Royal Fan, I do think the christening was planned with that birthday in mind. You know Royal Fan, if William and Kate choose to continue these tributes to Diana for the rest of their lives I wouldn't mind at all. That is their perogative and a very understandable one at that. Kind of like playing where's Waldo. adds some fun. Also not only was Queen Elizabeth's father baptized there. That is where he was laid in state. 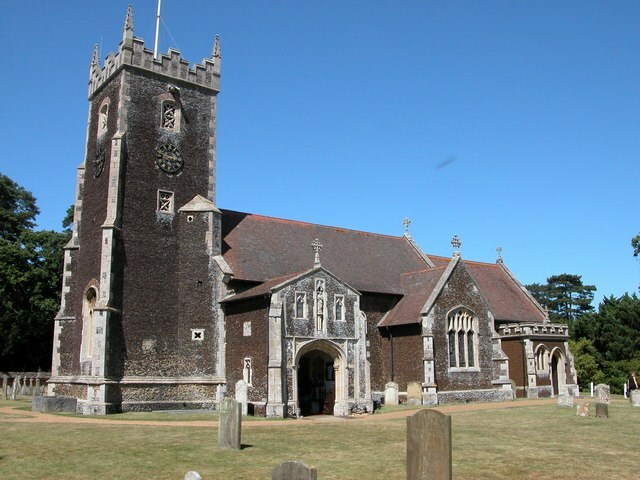 The church is a part of Sandringham estate. You know Bluhare I too have lost loved ones and have had to move forward with my life. But William's situation is somewhat different wouldn't you say. Whether he believes that his mother was killed because she stated to the world on television that she deemed Charles ability to be king non-existent or whether he believed she was killed because she was dating a member of a politically aggressive Muslim family who had stated designs on the British throne, or whether he believes the media was responsible for her death, who can blame him for wanting to keep her name and her memory from fading into the pages of English history. Add to that the fact that concerted effort had to be put forth to get her a proper place to lay in state, to be draped with an appropriate drape etc. And if the Middletons are helping him (I doubt that) who can blame them. They wre the closet to William during the time of all the posthumous scandals regarding Diana. It isn't like he is asking everyone to wear black for years like Queen Victoria or like he has had a huge statue of Diana built in front of Buckingham palace. So for every nasty headline, for every Royal snub, William is keeping her memory alive in beautiful good ways. Creating pleasant memories to be associated with his mother. Kudos to him. And, I think he is balancing thst out nicely with family, WORK, and Royal duties. Well said anon:25. I think we are seeing a glimpse into the extent of William's grief and need to have sympathy as well. It is still deep after all this time. I think it's a shame anyone can judge or question the references to Diana. Until you've been in those shoes, you'll never know what it's like. My father in law was killed unexpectedly in 2001; I never had the privilege of meeting him. We've been married 7 years now and have a two year old daughter and another baby girl due next month. We found a few ways to honor him at our wedding that meant a lot to my husband and his mom. I wish we had more ways to do so with our daughters the way the Cambridges do. If we'd had a son, his middle name would be his grandfathers name, no doubt about it (there's no feminine version of the name, or we would have chosen that). Just a few weeks ago, my mother in law and I were discussing the way my daughter smiles, and she said "She smiles like my husband... From her soul." You don't know how much that warmed my heart. A little piece of her grandfather lives in her! If we were able to bring my father in law's memory into special occasions like this, we would do so. It's not a matter of not moving on or "overdoing it". It's a matter of the heart. I think it's probably the fact that this little girl will be the first female descendant of Diana and I'm sure that's meaningful to William. 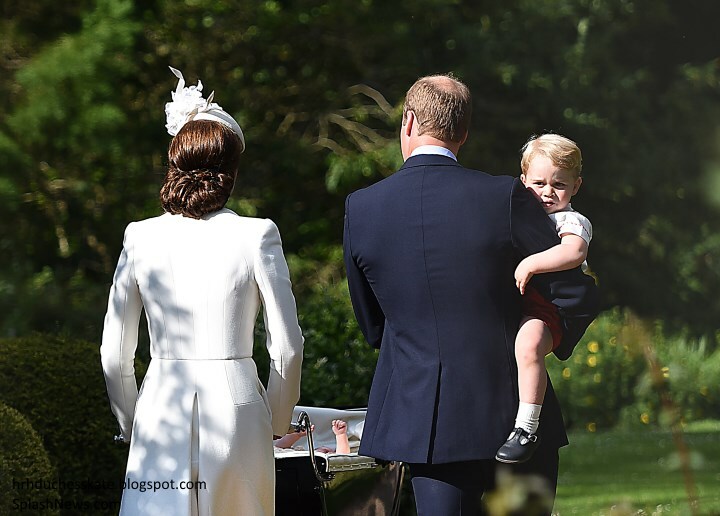 And also, George is the heir to the heir to the hair to the throne so his christening had to be a little more ceremonial and less personal. With Charlotte, William can honor his mother's memory and, hopefully, heal a little bit. I, for one, am happy to see all the references to Diana. For a while, it seemed like the only time William recalled his mother was when his PR people whined about photos of the family and reminded us all how Diana died. It's good to see that she's remembered and honored aside and apart from being a useful excuse for William and Harry to be awful to the press and their public. Also, I think there are so many sad memories connected to his parents' marriage and breakup and her death associated with so many of the royal palaces and places that maybe William is trying to banish some of those unhappy memories and replace them with new ones with his own children. There is a bit of an irony in "publicly" keeping Diana's memory alive - if you believe it was all the press that killed her in the first place - if it was because she was so famous. That Charlotte was given her name is a very natural thing to do to honor a parent - just as her first name honors William's father and her third name her grandmother. But I think it is possible that it is the press and public that are making connections that aren't necessarily deliberate. Charlotte was going to be baptized somewhere - and any place they picked would have had a reference to Diana -- they chose the church closest to their house - "so insert Diana reference here". Someone suggested that if William wanted Charlotte baptized on Diana's birthday it would have been so. This is simply not true - the Queen had commitments in Holyrood on Diana's birthday - the christening date was chosen by consulting with the Queen and Charles' schedules to determine what was suitable. The inclusion of a Spencer relative is no more significant then the inclusion of a Middleton relative as a godparent. Cousins were chosen. So pretty much by focusing on select details - you can make it all about Diana. I think it's pretty insulting to infer that someone was chosen because they are Diana's niece - and not simply because she is a beloved cousin with her own relationship with William. It wasn't about including Diana, it was about including Laura. That was a predictable comment as was the one by her sidekick. We all knew those were coming. Regardless of whether you had a similar situation or not Bluhare it is certainly Williams choice to commemorate his mother as he personally chooses to do so whether the world remembers her or not on its terms. I think it was about Diana AND Laura. What a beautiful post, Jessica from Los Angeles. bluhare, I think it's safe to say that aside from W&H, the RF would prefer not to see or hear a reference to Diana. I'm not sure anyone else here can relate to all the factors that are involved here, so I believe it's very fitting that her sons have done things to keep her memory alive. Moxie, why do you feel the need to dismiss all the positives here? I'm sorry, but you seem determined to do so. Everything, every tiny detail was wonderful! Thanks for this very up lifting post - it's made my already good day great. Why did the nanny have to wear her norland uniform? Tradition...and she was there in an official capacity, not as an invited guest. If she didn't wear a uniform there would be complaints about her being "invited" and other family members not being included. I don't think she HAD to wear it. She is trained their and since she was probably on duty this is her "formal uniform". I don't think she had to, I think she chose to. Probably given her role in their life, this is what she wanted to wear as *formal* wear. This uniform is steeped in history and prestigious in the nanny world, and if she's proud of it I say all the power to her! Norland needs to keep the tradition but update it considerably so that it isn't in appearance so off putting. SO true Royal Fan. That perhaps perfectly explains IMHO why she wore that austere looking uniform. You could also infer it shows where her place is, at least that's what I'm reading from all your comments. She didn't wear that uniform in New Zealand, she didn't wear it at BP, she hasn't worn it any other time. Why today? How about so she matched the pram and the vintage theme? Sounds much nicer than so we all know she was working and not an invited guest. bluhare - was it because she was in the presence of the Queen and Phillip? It made her recognizable as staff. I don't think she was hanging out with the Queen at BP but probably off in another room to look after George if he needed to be removed from the family gathering. The uniform helped make sure that she didn't look like the godparents Elizabeth and Phillip were going to be meeting and thus they didn't inadvertently strike up conversation with her. So yes, I'm inclined to think it was to mark her place in the gathering and it was because she was in the presence of the Monarch. Moxie - I could easily envision a scenario in which the nanny actually just fades against the wall during the BP lunch while Kate and William take George around to meet the family, ready to pounce if he needs to use the bathroom or change clothes or be taken out for a temper tantrum, etc. Otherwise either Kate or William would have to leave the lunch to deliver the baby to Maria, which doesn't seem that realistic. It just seems to be how Kate and William operate in general - the way Maria worked in Australia during events, her going to Mustique, etc. Anyways really the thing is - I highly doubt the Queen expects the nanny to be in her official college uniform in her presence. I feel like any kind of "uniform" that looks somewhat professional/official would do. Since not all nannies come from official backgrounds like that with official uniforms. My guess is Maria couldn't dress up like the PO's because, lol, they had to differentiate the nanny from the guests. Not because there would be an uproar for her being invited - I think most people would realize she was there in a working capacity lol. But just because it wouldn't be appropriate for the help to mix in like that >>. But I bet the choice of the Norland uniform specifically was Kate's call - to go with the vintage theme. I doubt Maria just got to decide on her own what to wear this day of all days. Everything was very carefully orchestrated. I mean for goodness sake's she could have been less modern than usual by wearing a skirt and top or a dress and still looked much less "look this is our servant!" around everyone. And I'm not trying to demean Maria when I say that, and if she truly did choose to wear the outfit - then I take back everything I said because then she clearly feels honor in that uniform and that's totally respectable. Moxie! I'm really surprised at you! in a very formal way. She looked very proud to be wearing it. I can see if she would be required to wear it everyday you might have something to complain about, but since this is the first time we have even seen it I think it was her way of being part of her family. I for one quite liked seeing her in it and helping Kate position Charlotte in the pram and keeping a diligent eye on George. On a less positive note, though, I was suprised by the coverage of this event: I couldnt find any tv channel with live coverage, probably because of the events in Greece, but I remember watching PG christening live on BBC. So I was left utterly confused. I havent seen Maria Nanny in her uniform before, but I pretty much hope I will never again. Horrific!! Even Kate' PPO managed to pick a nice suit! If they werent so good sisters I might think that Pippa tried to steal the show with this dress and her towering heels, and her usual orange tan. Blue27, your comment about Nanny Teresa's uniform made me laugh out loud! She worked very hard to earn the right to wear that uniform. I give her all the credit for wearing it. Interesting that they carried on links to Diana by way of Laura Fellowes in addition to the other things. Love George's curly locks! 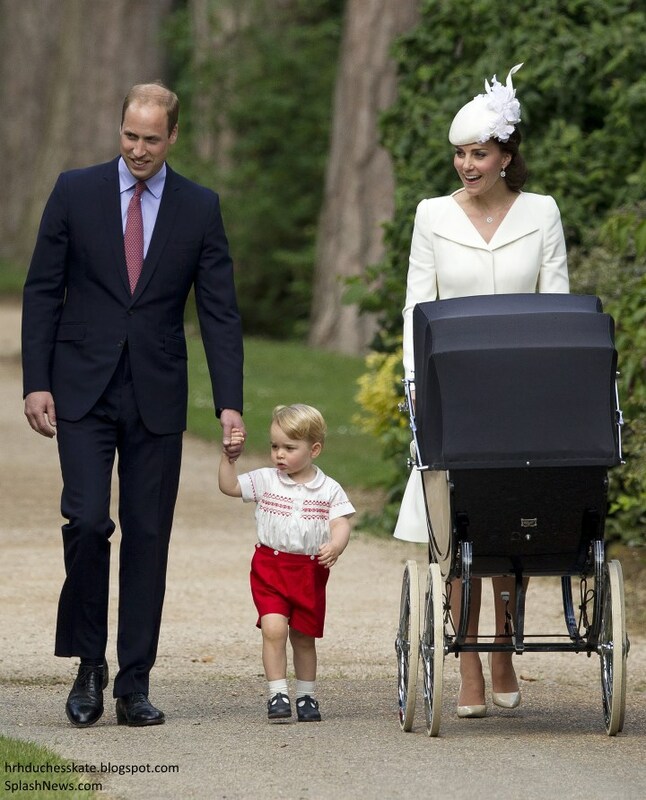 I think Catherine is the only one I've ever seen that dressed up and pushing a pram (here in the US--a stroller). ; ) I like how they kept within tradition, but with a twist--this time allowing for the public to say hello. It was a nice jester since there wasn't anything other than a fast look when Charlotte was born. So nice! 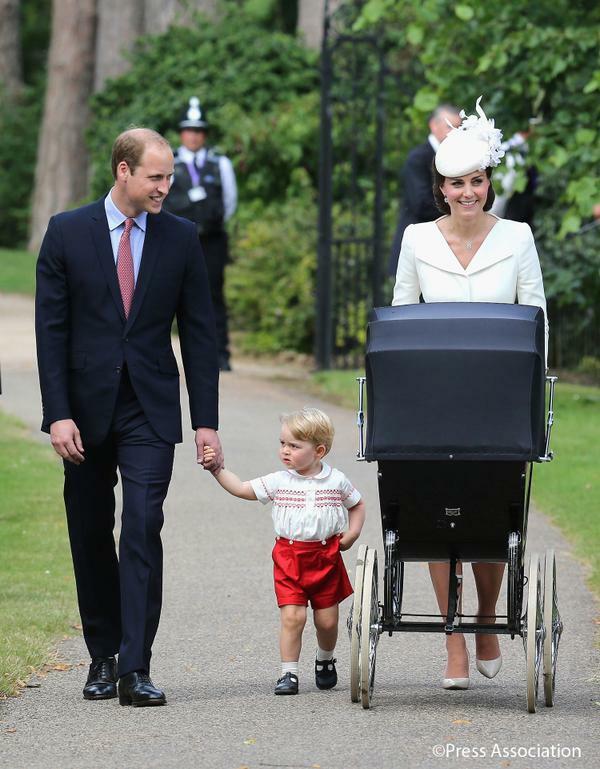 The pram that Kate used belongs to the Queen and she used that for her two youngest. It is a part of the Queen's Sandringham estate as indicated on the estate's official website. Charlotte: I hardly comment anymore but I always read all your posts and just wanted to drop by and acknowledge your dedication as well as your professionalism. Your published work is organized, well written and "the real time" aspect of your posts makes it all wonderful. Thanks again and all the best. You did a marvelous job of posting so much information so quickly ! Everyone looks lovely , and happy . On a personal note , I can't believe Kate could walk a quarter of a mile in high heeled shoes , I couldn't do it ! There were so many exquisite photos from today. Many of them to become iconic no doubt. The photo of George looking into the pram as if to make sure his little sister was still around after all the ceremonies and crowd, how sweet and priceless. Lovely post as usual. We can't thank you enough Charlotte! I always know I can get good updates, information, wardrobe ID's and great photos on your blog. It was a lovely event that I was so looking forward too. The Cambridges are such a wonderful family together. I can't wait to see more pics of them as time goes by. Georgie is quite a character - but so adorable! I can't wait for the Official Christening pictures! My guess is that they were already seated in the church when the Queen arrived - isn't she normally the last person at any event (other than the Cambridges in this case, of course) - so outside the church was probably the first time they were greeting her today! What a lovely post Charlotte and a beautiful day. It was wonderful to see them walking into the church and everyone visiting after the service. Baby Charlotte looks beautiful! I wish we could have seen a better picture of her face. She looks like a stunning baby girl. It was so nice to see everyone looking so good today. I loved Kate's hair up and her necklace and earrings. 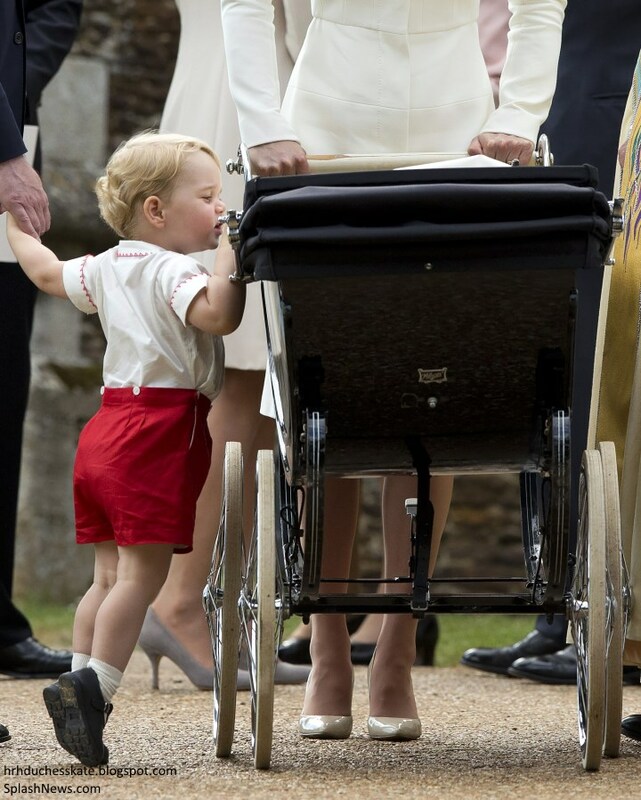 She looked fabulous (as always), and that little George is a character and adorable. I look forward to seeing the official photos. Ahh yay! I can't wait to see the official photos! George looks adorable in that little outfit and Kate looks flawless as always, she is just glowing! I was wondering if you could tell us what the temperature conditions were for the event. I noticed lots of folks in the crowd wearing jackets and that seemed unusual for July - but perhaps things are generally much cooler in Norfolk? It was quite a rainy morning but thankfully the sun came out before the christening. It was quite a warm day actually, I understand the temp was in the low twenties in Norfolk. "The Queen’s father, George VI, was christened in the same church in 1895, but for the next three generations Royal palaces were used for the christenings of all senior members of the Royal family." Is there anywhere that you know of Charlotte where you can find a video of the entire event (except inside the church, of course)? I would love to see the Midfletons arriving and the Middletons curtsying to the Queen. Yes, and it was pathetic. I was very disappointed. The Telegraph's live feed, sadly, was a joke. The live feed was awful! Twitter is your best bet for some short snippets of video. I have a question-and this question or comment is in NO WAY a complaint or a slight to anyone in the Royal family or anyone belonging to the Church of England. It "seems" that no one attends church services on a regular basis. That said, maybe they do and it just isn't reported or maybe the Church of England doesn't require a weekly mass like the Catholic Church does. The Church of England is an off shoot of the Catholic Church right? Please don't anybody be offended I am in no position to judge anyone, I am just wondering..... Thank you. - the Queen attends on practically a weekly basis. She is apparently religious and takes her role as the head of the Church of England seriously. - Charles & Camilla...I don't know, but I don't get the impression they attend unless they have to. - Kate was not confirmed until she was engaged, but her parents did have her christened as a baby. Clarence House said it was a decision she made as part of her spiritual journey, but many commented (and I believe) that it was strongly suggested - she will one day be married to the head of the Church of England. I'd say the first year of marriage Kate would be seen wearing a cross pendant. - William & Kate only attend church when they have to. They visited the Queen in Scotland once, maybe the first year they were married, and they were seen attending a Sunday service with her, but once again I would consider this "when they have to". I'm not judging their personal choices either, and church attendance doesn't reflect ones personal beliefs or convictions. I just looked that up today myself!! I wondered the same thing just out of curiosity. The queen attends every Sunday. Does any one know if Becca Deacon was there today? She has been present for the birth of the children. (although I didn't see her around during Charlotte's birth.). Just thought she might be there today. I am so pleased with their choices for godparents. I know William and Kate will be so thoroughly relieved to know that. - at Charlotte's birth her boyfriend was on scene a couple days before, when KP staff had us all excited something was going on. This time we didn't see the hairdresser enter, so maybe Rebecca did sneak in and out without us noticing...or maybe she wasn't needed as they left the same day. - they have made it clear the christenings are for immediate family and godparents & their spouses only. Regardless of how hands-on Rebecca is, if you invite one staff that breaks the rules and then maybe you'd have to invite other staff, and so on... Also, it seems some media was surprised again that Charles' siblings were not invited. Can you imagine if they invited staff, but not the Princess Royal? It's so tricky, but they have to keep a cap on it and be consistent. I saw Rebecca step quickly into the shadows during the arrival at the church, as though she did not want to be too visible. I wonder if seeing Charlotte in the pram she used for her two youngest children brought forth memories for Queen Elizabeth. I am glad that William had his hands on George as Queen Elizabeth talked with him and that Maria was poised and ready to help as George could probably do some harm to her with the slightest impetuous move. When will the official photos be published? The royal reporters think Wednesday. Perhaps Tuesday night we'll see them in time on the cover of Wednesday's papers. Nice photos and it looked like everything went well. I think the one thing I noticed - and I saw this at the Lindo Wing pics too - Kate just doesn't seem as happy or enthusiastic about little Charlotte as she did about George. She barely looked at the baby today and even when Kate was holding her daughter, her smile seemed almost forced, a smile for the cameras. But when she looked back at George, absolutely a different look on her face, soft and warm and loving. It seems like Kate's world and Carole's world is going to revolve around George and little Charlotte will come a very distant second in their affections if she does at all. We never saw Diana act that way with Harry, nor Charles, to both their credit. But if you hop back a couple of generations, the queen's own father, a second son, was treated horribly both by his nannies and his parents and that was the rule, rather than the exception, for the English royal family through history. Second children, especially girls, were pretty much dumped with the nanny so the focus and the love could go to the heir. I hope not. I wanted Kate and William to be the ones to start to break the crippling, antiquated dysfunction of this family but it seems like history is repeating itself. Kate and Carole seem focused exclusively on George. I can't think that's healthy for him or his little sister. Kate's outfit was OK, nice but I have to think, with the heat wave the UK is having, those long sleeves were pretty hot. I wish someone would update the nanny's uniform. It looks like something from the 1800s as does George's little short suit. You are reading ALOT into a few photos. I didn't get that impression from those photos at all. There is no polite way for me to reply to this. Clearly, we were not looking at the same photos. Wow, Elizabeth, what a horrible thought to have. I would have to completely disagree with you on this matter. I think Kate looks absolutely taken with her new daughter and I am sure, behind the scenes, as we have yet to see the newborn with her grandparents, that they are completely smitten as well. One picture is incapable of capturing the love a mother has for their child, in fact a thousand pictures probably couldn't hold up to it either. I think what we see is a relaxation that is common with second time mothers; you are less worried, less stressed, less nervous about every little thing that you are doing and everything that could go wrong. I think both Prince George and Princess Charlotte are equally loved and cherished by their family and anyone who would dare think otherwise needs some serious introspection. On another note, I for one loved Kate's look today, she was glowing with happiness and I think her sartorial choices only highlighted this lightness. I would agree with you on the fact that those sleeves seem rather unusual given the heat, but they were in a church service and Kate always wears conservative looks when attending a religious event. As for Maria Teresa's outfit, it is traditional nanny's uniform, no one has ever been caught praising the styling of uniforms, I doubt it'll start now. 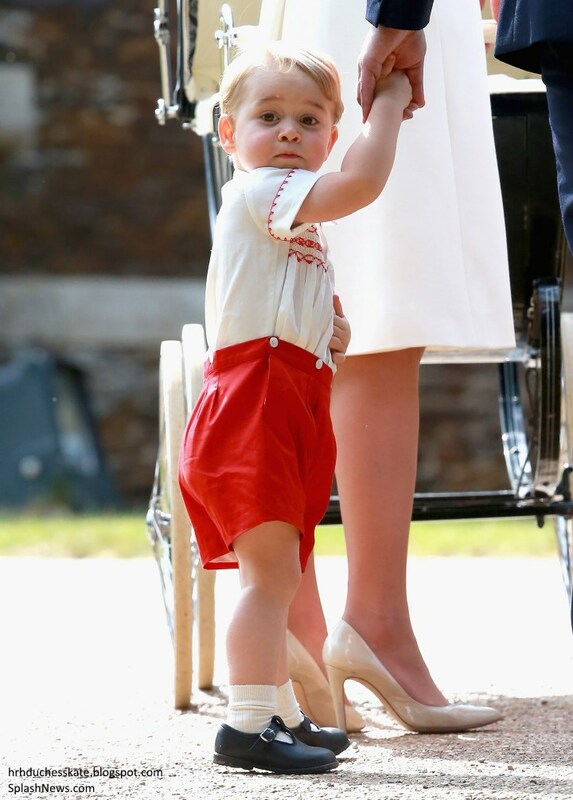 Also, I loved George's shorts, they were utterly adorable and fitting for a future British king who will live his life surrounded by history and tradition. All in all, I thought today was a lovely event that captured a happy new family of four and the people they most love and cherish. I look forward to seeing the portraits released in the coming days. Elizabeth, I kinda thought the same thing at first, but then I remembered - there were 3,500 people screaming and cheering for them as they walked down the path - I'd be very concerned about a toddler in that scenario too. Charlotte, on the other hand, was well protected in her pram and also oblivious to everything going on anyways. If George had a bad experience today with the christening, that's something that could affect him for awhile - make him dislike crowds or feel jealous of his sister - both of which would be quite detrimental to his emotional development as either a future King or a big brother. I do kind of feel like in general Kate seemed more focus on putting on the perfect show, rather than really enjoying the day and the fact that her daughter was going to be christened. I felt the same vibe during their wedding. And I can't blame her. If 8293082093892 people were watching me get married or walk my daughter and son down to a church, I'd be really nervous about something messing up too. Especially since this was George's first Sandringham walk, which is a big deal even if it isn't Christmas. If George threw a tantrum or just started bawling for the entire walk, people would start saying Kate and William clearly can't parent him and that he must need his nanny. So she was probably nervous about that, and also just about making sure her toddler son wasn't hating life. It's probably hard to really get into the emotional part of the day with Charlotte until they're inside and away from the public, especially since Charlotte experiences a much smaller range of emotions than George right now lolol. At the Lindo Wing with Charlotte she left the same day she laboured and delivered. With George she left the next day. I felt that her exhaustion was evident in May, especially with how shaky she was. I also thought she did admire and dote on Charlotte that day. There are photos of Kate looking in the pram smiling without George right there. OR maybe she is concerned about making sure Charlotte doesn't start crying , burp (or worse!) on the historic christening gown, or fall out of her arms. There are a lot more variables with a baby than even with a young child, and for a woman who has the entire world watching and who has always tried to do everything perfectly, her stress when caring for the Princess is to be expected. Or, yeah, maybe she just doesn't care about Charlotte because she's the spare. One or the other. It's funny how we interpret things individually. I thought Kate looked happy but nervous at George's christening (a brand new mom with a two month old baby) and she looked happy but calm in this one. Funny! Goodness, Elizabeth, you are assuming a lot! Charlotte is a baby, George is an active toddler. Kate is probably still breast feeding Charlotte and has a close maternal relationship with her. I thought the way she took her from the pram and smiled at her was lovely. She and Carole can hardly take Charlotte off to the farm park just yet. George on the other hand is obviously a bit of a handful, and requires careful control and outlets for his energy. A whole different set of needs! 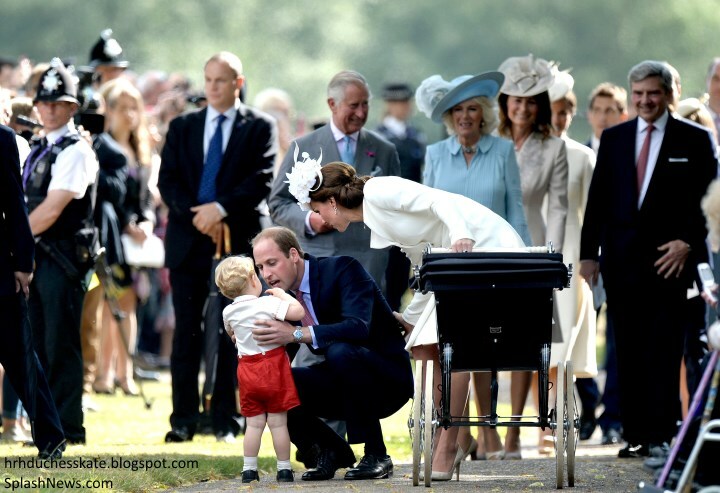 I was very happy to see William taking care of him during the outdoor parts of the christening day. He is obviously a skillful father. And how in the world do you know that they will dump Charlotte and focus asll on George. Your comments have really pisst me off. You make these nasty comments with out warrant. Why don't you write on something that you have the really facts. And not this garage of them not going to love Charlotte as much as George. Is Sophie Carter the unidentified blonde in the pictures with William, Pippa, and James in Mustique this year? Here's a picture that makes her look about the right size, and I know she's been to Mustique with them in the past. Post will not start mean spirited comments on how much Kate Loves her Daughter. Is Thomas Van Straubenzee married? Thank you for your wonderful coverage today! It was such a treat to read. -Kate's outfit was exquisite, so sophisticated. I liked it so much better than the outfit she wore at George's christening. -I wish Pippa and Carole had each worn something more colourful. Pippa's outfit looked almost exactly like Kate's. It was a bit weird! 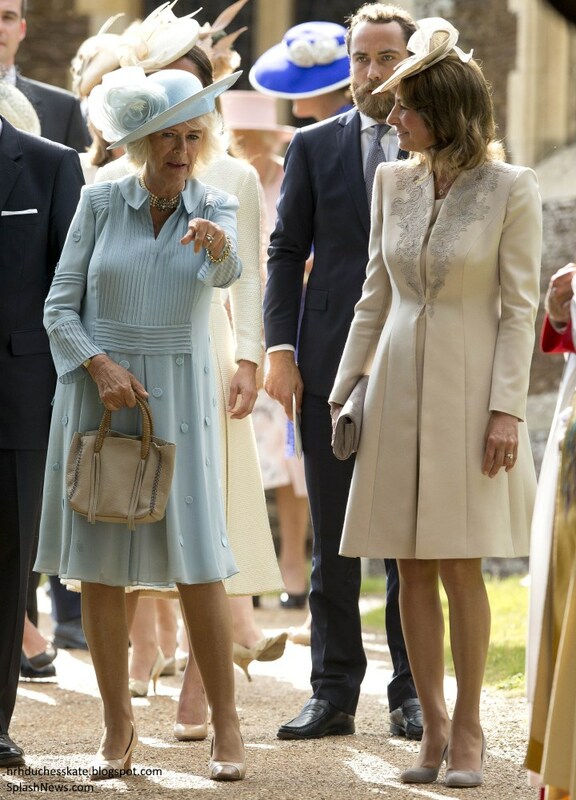 Carole's outfit looked very much like the coat dress/long jacket (which was a light blue colour) that Kate wore to either the Garter ceremony or the Trooping a few years ago. -James Middleton-You're NOT George the Fifth-lose that awful beard-please! -Nice choice of godparents-very close friends/relatives. I loved Sophie's ensemble. I hope we can see a better photo of it. -I think today shows definitively that William and Kate are trying very deliberately to memorialize Diana in some very personal and meaningful ways: choosing a date as close as possible to Diana's July 1 birthday, the choice of the church where Diana was christened, Charlotte's name, the choice of a Spencer cousin as a godmother and the choice of Mario Testino as official photographer while his exhibit of Diana photos is on display at Kensington Palace (those photos of Diana are breathtaking!!). -I really admire William and Kate for this. It must be really difficult to walk a fine line, remembering the best of Diana, but making choices that aren't maudlin (as many are when remembering Diana) but also are meaningful while respecting today's realities (Charles's reconstituted life with Camilla, the handling of historical accusations of insensitivity on the part of the BRF in dealings with Diana, etc.) Imagine how they would be flayed in the press if they didn't somehow include Diana? -I think Charlotte looks like Aunt Pippa-can't wait to see the official photos to try to get a better look at her. -Maria the Nanny-THAT UNIFORM!! !-I expected to see her flying through the air with an open umbrella and her satchel in hand!-I hope to never see the poor woman in that thing again! It must be one great job to be worth wearing that for pictures that will be around forever. -I like the occasion's "retro" vibe- George's clothing, Nanny's uniform, the big old pram but it's just skimming the border of being too much. 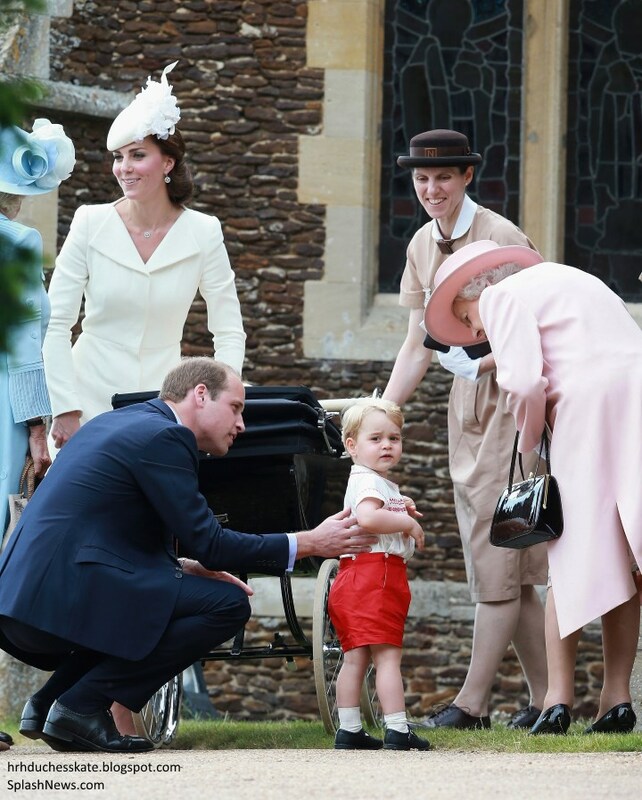 I'm not sure I get the several instances of dressing George in replicas of William's toddler outfits. Is this another subtle tribute to Diana's choices? I think there must be many more updated choices for George. -While I'm on the topic-Gorgeous George! Gorgeous George! Gorgeous George! What a splendid day! Have a great week, everyone! Thank you so much Charlotte for this wonderful post! Catherine looks absolutely gorgeous!! wow I love her outfit from head to toe love her hair too! George looks adorable, william looks so handsome and what a beautiful tribute to his mother to have the christening so close to her bday! Diana should have been there today! I love the baby how beautiful and cute she looks. God bless this royal family.